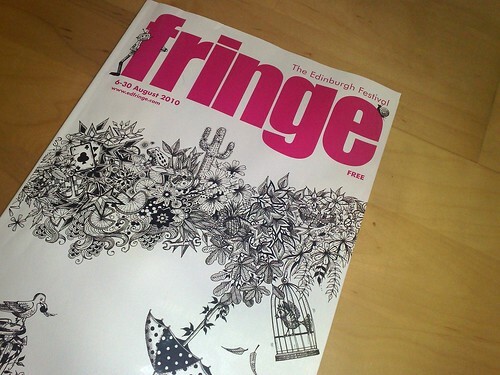 Until 30th August the prestigious Edinburgh Fringe Festival 2010 will be spreading art, comedy, performance and dining experiences across the city. One thing that particularly caught my eye if any readers are lucky enough to try it out is a unique dining experience whereby guests eat at a height of 100ft above the city, hanging from a crane in special seats at a large table! Skyscanner.net at running the Festival in the Skyin the beautiful Princess Street Gardens. The Demise of Christopher Marlowe theatre production at the C Central. Creatures Comedy Show for some dark comedy sketch show at the Jury’s Inn. UK beatbox champion, Beardymanfrom 16th-17th August at the Udderbelly Tent. For a free children’s event, go to the music, story-telling and puppetry of the Hamwehads from the 11th – 19th August at The Three Sisters. Flow-pattern– John Reiach photography exhibition from 13th August at the Faculty of the Advocates. This entry was posted on August 10, 2010, 5:46 pm and is filed under Events, Festivals, films, Fun, Scotland, shopping and culture. You can follow any responses to this entry through RSS 2.0. You can leave a response, or trackback from your own site.